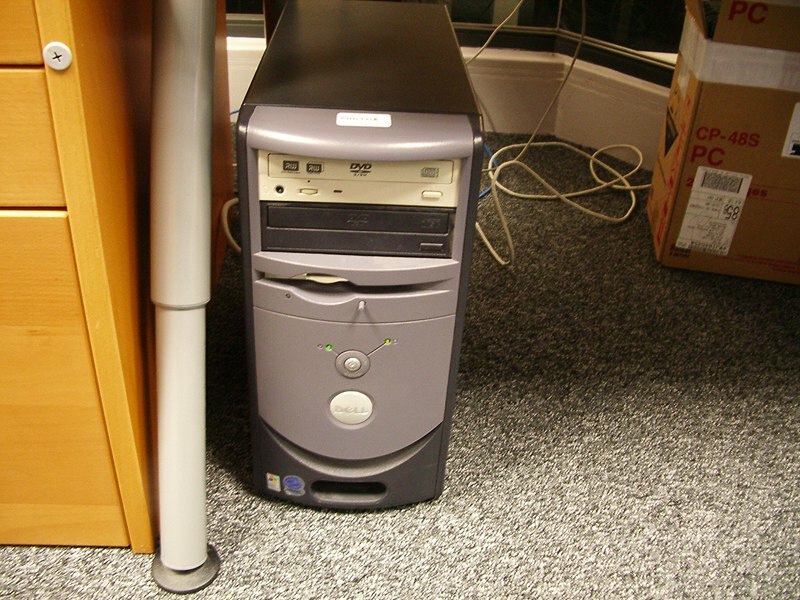 Some time ago at work, when I was still running my lowly but faithful 128 MB Duron 750 MHz PC, the director’s wife’s PC was fitted with a DVD-RW/CD-RW combination burner. I am not sure why it was given to her but I am guessing it was because it was a predominantly spare computer and it was fast enough for the task. Nevertheless, conflict over use of that PC has arisen on numerous occasions when I have been burning a DVD or CD and she has decided to come in and use it herself. Now that we have moved premises, her PC is now in a separate office shared by her and her husband (when they are in, that is, which is admittedly not too often) at the far end of the floor, and this is a bit more of a nuisance than it was before. Today, after losing access to the office and the DVD-ROM drive I needed to use (and the disc it contained) for an hour or two, I decided that it was finally time to take very long awaited action. It was probably the gayest thing that I have done in a very long time. My own new Dell office PC lacks not only any form of DVD drive but also a floppy drive; strangely enough those prehistoric devices are still useful to us. So my first task was to steal one from a dead machine in the office. 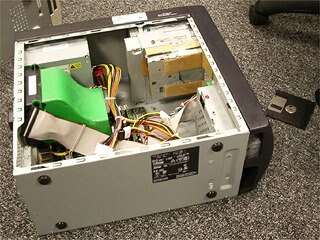 Dell, in their abounding generosity, declined to supply a 3.5″ drive cage behind the floppy drive slot, so even supposing you were in possession of such a horror, there was nothing you could do with it if you tried. I attempted to fit two different drive cages stolen from two dead PCs but they were too different to be able to coerce into fitting. Migrating the DVD writer in the meantime was significantly easier; the harder part was locating the cover panel for now empty bay on its former host PC, and my boss had to go dig that out; I have no idea where he found it. 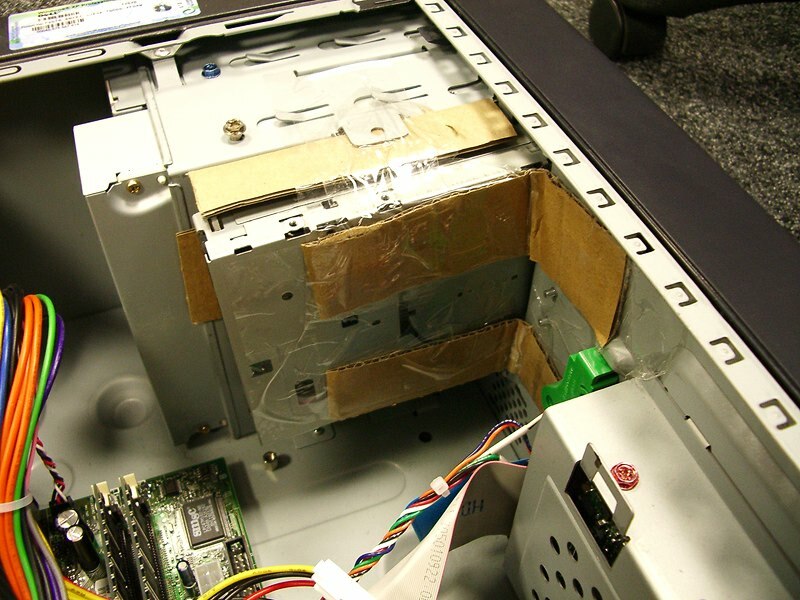 I was feeling extra naughty at this point so I also swapped out my CD-ROM drive (the only optical drive in my brand new PC) with the DVD-ROM drive from the director’s wife’s PC. Optical bliss befalls me. 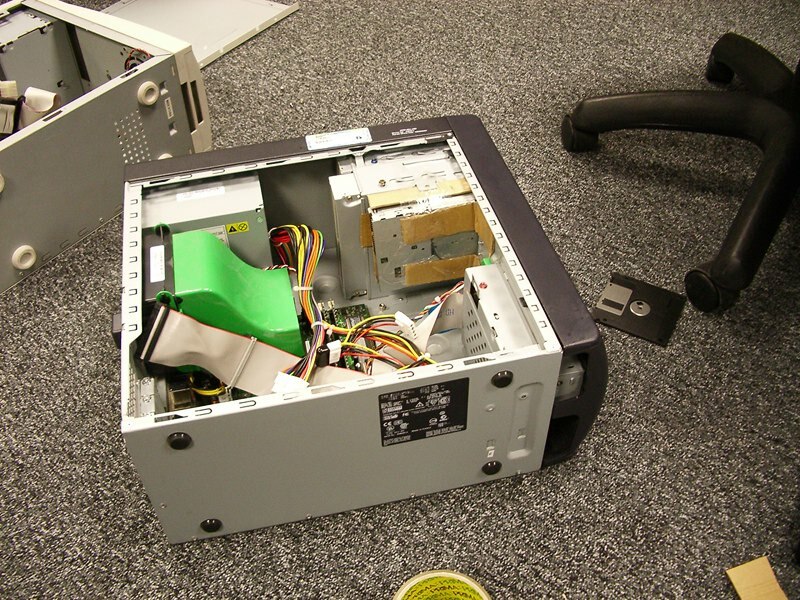 With that done, it was back to fitting the floppy drive. 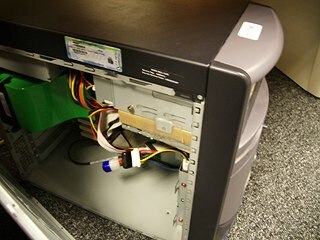 I was determined to fit one to my PC even without a fitting drive cage; this is where the fun began. In Dell’s infinite wisdom they decided that the only 3.5″ drive anyone would ever need to install was a floppy drive, casting aside notions of such devices as Iomega Zip drives and tape drives. 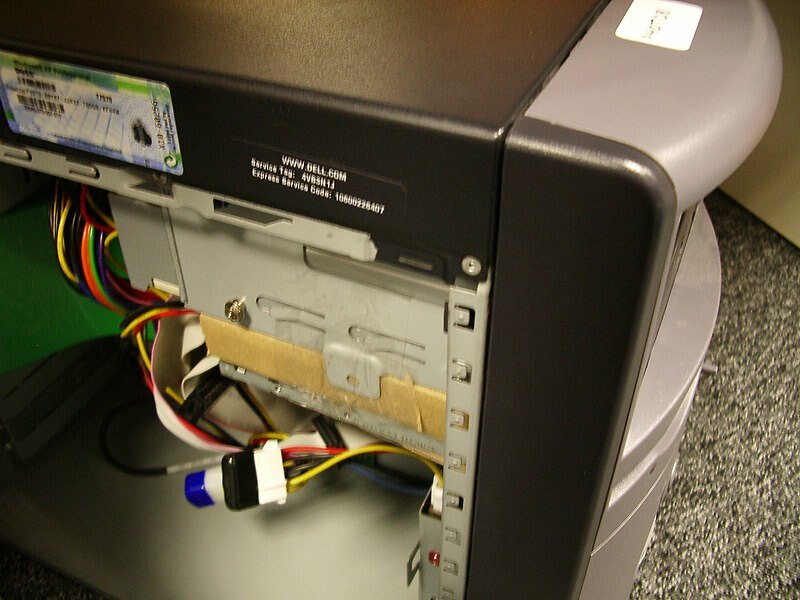 To this end, the front panel of the machine contains a specially moulded floppy drive slot – with a light channel and eject button as part of the assembly – in a size and shape that defies trying to fit a normal drive. I know Apple are extremely protective of the look and feel of their case designs but evidently Dell have a touch of this as well. The drive has to go back some way so that the front panel eject button correctly operates the drive’s button without not being able to insert a disc at all from the eject button of the drive being blocked. I imagine you are supposed to buy some sort of floppy drive kit from Dell to fit to the machine, but that would be capitulation to the designers of this most fruity case and I do not like giving in! 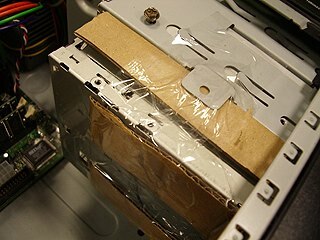 Once I had determined the exact distance that the drive needed to be from the front of the slot in the metal front panel, I taped the drive roughly into position to hold it in place for a minute. 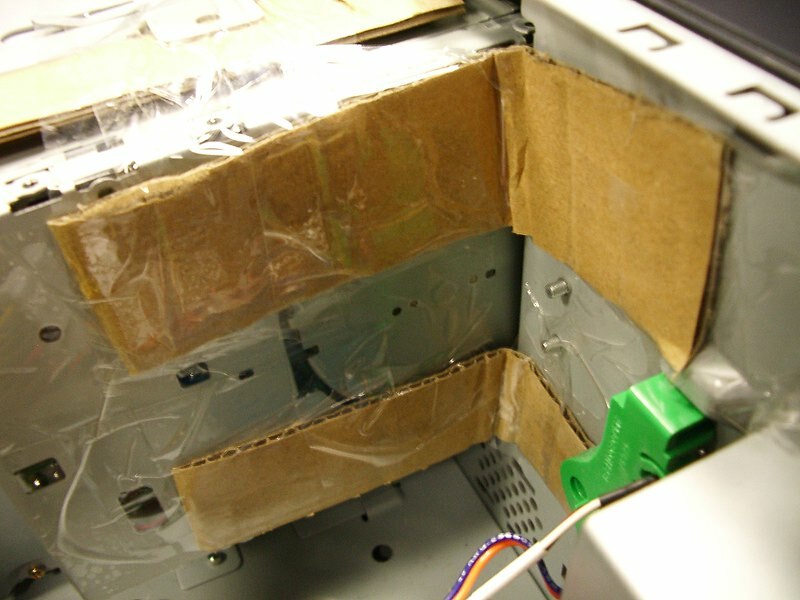 Corrugated cardboard padding was used to fill the gap between the floppy drive and the optical drive cage to hold the drive into position vertically. I formed a left drive bracket out of cardboard, and taped it to the inside front of the case and to the drive itself. I inserted padding between the drive and the 3.5″ cage bracket and securely taped the drive to the optical drive cage. This was followed by a second bracket on the far side of the drive, and plenty more tape. The Dell Dimension 3000 PC with assembly completed. 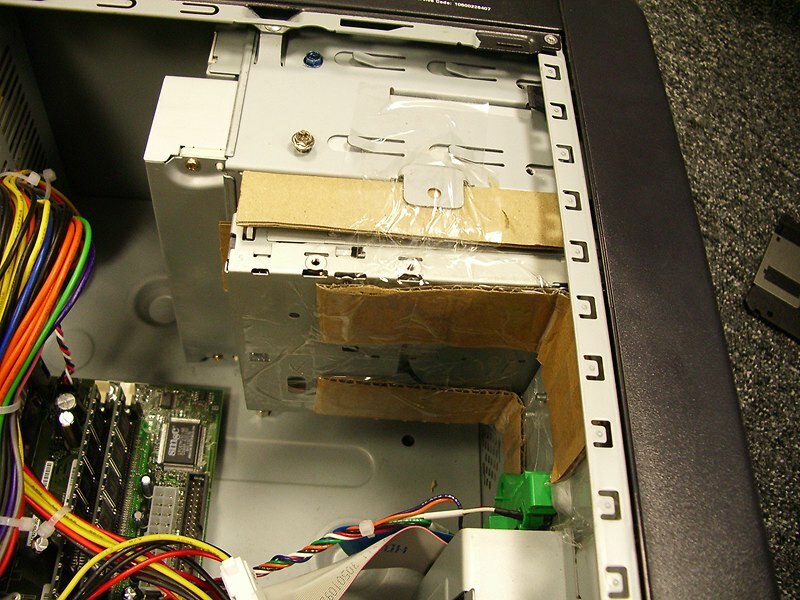 You can see also the surrogate PC (which now lacks not only a hard drive but a floppy drive and drive cable), the test floppy and the roll of tape. 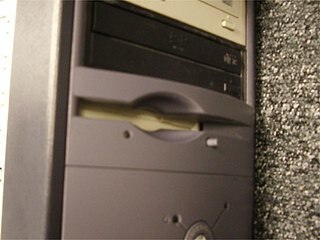 A close-up view of the drive slot showing not only the mismatch but how far inside the case the drive has to sit. Of course, the computer industry loves to indicate which way up drive cables go, and mould slots that enforce a correct orientation. I can never remember which way they go, yet I had a 50/50 chance of attaching the floppy drive cable correctly. I failed. (I could see that one coming a mile off) The drive light was permanently illuminated in the telltale sign of a reversed floppy drive cable. D’oh. 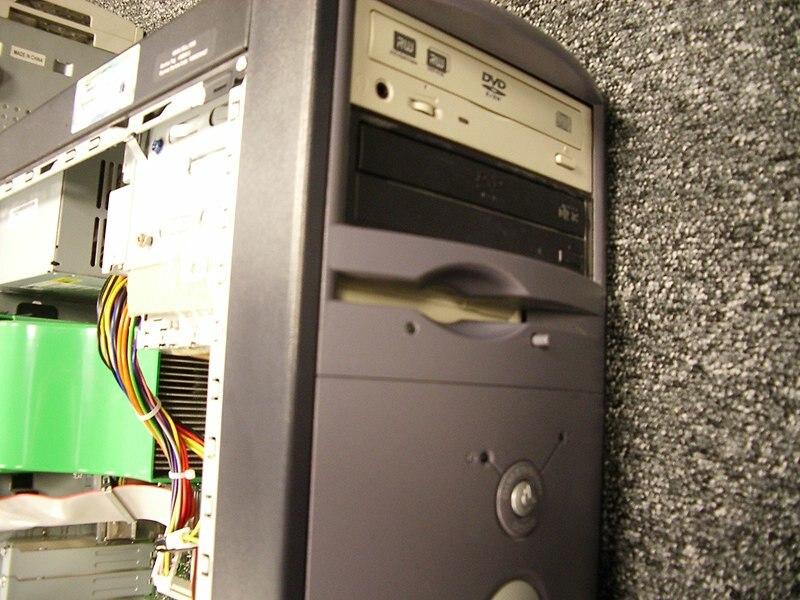 With the machine powered up and taken out of hibernation, my 48-day uptime Windows XP Professional installation detected both optical drives successfully. That is, as successfully as you can get with a BIOS which actually prevents the operating system from automatic access to new drives. I had to re-enter hibernation and reboot to inform the Dell BIOS that there was actually a new second optical drive installed (else Windows would only achieve PIO mode; see Oh, just in case…) and a floppy drive. Unfortunately, Windows requires a full restart to detect a new floppy drive, so for the pride and assurance that my jury-rigged floppy drive install worked, I had to bite the bullet and restart Windows; something I have not had to do in 48 days of workday hours, which is about 150 person days. Needless to say the drive worked. Nero Express 6 install crashed part-way through though so I had to run that again to install the burning software. Don’t you just love it? I know you do. All done. Yes, the eject button does stick right out even with no disc in. I am not sure why but what I am sure of is that it is too late to do anything about it now!